Unordinary Style: Bracelets, Bracelets, & Even More Bracelets!!! Work, work, work!! I'm so funny! Why? Well..... I didn't have to work a couple of weeks ago, but I volunteered for the contract, and thus worked I did. Then this past week, the same thing happened. Next week, I'm back to my regular employment. All of this wondrous work has left me a bit stressed out, a bit more moolah in the bank, but a bit tense. So how did I spend my weekend? Working! Ha! Well, is it really work when you love it? Woodworking is quite a passion of mine and thus, I spent Saturday and Sunday finally figuring out how to make myself some bracelets. It is something that I have pondered for quite some time. I really like, well maybe love, silver bangles, but alas, my largish man hands basically prevent me from owning any! Low I was sad that I couldn't fit into my mother's bequeathed silver bangles. Anywho.... I figured that maybe the easiest way for me to have some cool solid bracelets would be to make them myself. I toiled away for a couple of days, and figured out several different ways to make some, and a couple of ways to NOT make them! 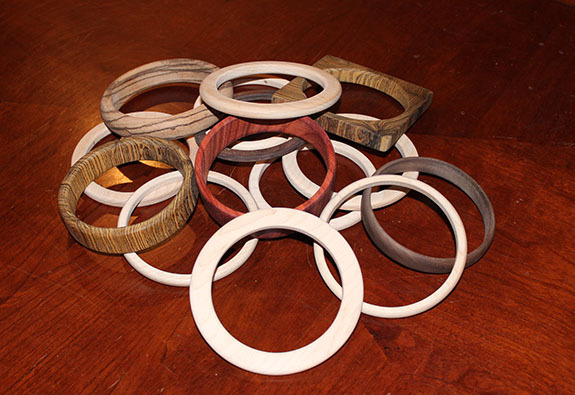 When they explode off the lathe, you kind of figure out pretty quick that you shouldn't do that! So.... I'm pondering opening an Etsy store and selling them in custom sizes and materials. I figure that I could pretty much make them in any size, thickness, and materials. It would be good for us transgender folk, as well as cisgender people. Hmm.... maybe I could figure out how to fit that into the other ridiculous amount of things that I do. Which kind of makes me think.... maybe I just like to work. Well, enjoying working, maybe not always enjoying the work. Odd to say but what you said does make sense to me. When you like the work it is almost not like working.